The Eagles’ Jalen Mills, left, was called for pass interference as he defended a pass intended for the Falcons’ Julio Jones during the teams’ meeting in November 2016. A couple of weeks back, we looked at where the Eagles stood headed toward the playoffs, and what they needed to show us over the last few games of the regular season. Now, we're checking back in with how they look against their divisional-round opponent, Atlanta, and what they need to show us Saturday to demonstrate they have a prayer in the NFC Championship Game, should they defeat the Falcons. Where does the Eagles’ defense stand, in terms of being able to stop the Falcons’ offense? 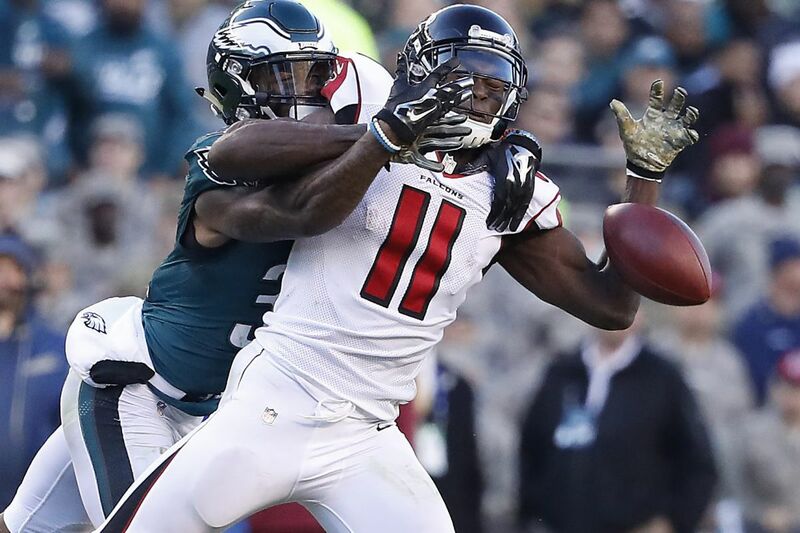 Julio Jones will be a huge test for the Eagles' secondary and top corner Ronald Darby. The emphasis probably will be on not letting Jones get behind them; if he gets, say, 10 catches on 16 targets for 135 yards and no touchdowns, as he did in the Eagles' 24-15 victory over Atlanta in November 2016, that might again be survivable. Atlanta has a two-pronged running attack, in Devonta Freeman and Tevin Coleman, that is respectable but not on the level of, say, New Orleans, with Alvin Kamara and Mark Ingram. Freeman rushed 12 times for 49 yards the last time the teams played. The Falcons ranked 13th in NFL rushing this season. The Eagles, of course, were No. 1 against the run. Then there is the matter of Matt Ryan, 2016 NFL MVP. He was solid down the stretch of Saturday's wild-card-round win over the Rams, but some of his early work in that game was no better than what we've seen the past few weeks from Nick Foles. The Eagles must get constant, strong pass-rush pressure. The rush really tailed off in December, but the key guys have gotten quite a bit of rest the past few weeks, and they should be refreshed. The game might rest on their shoulders. If the Eagles win, what does the defense need to show us to give hope for the NFC Championship Game? Multiple sacks. Turnovers. Maybe a pick-six or a fumble recovery for a touchdown. Hold the Falcons to fewer than 20 points. Where does the Eagles’ offense stand, in terms of being able to score against the Atlanta defense? The Falcons this season allowed an average passer rating of 91.9, which ranked their defense 21st in that category. That's where the hope for Foles lies. In the 2016 meeting, Carson Wentz was able to work underneath effectively (the area where Foles is most comfortable), with running backs catching 10 passes for 87 yards and tight ends catching seven for 64. Wentz didn't complete a pass longer than 20 yards. If the Eagles win, what does the offense need to show us to give hope for the NFC Championship Game? No turnovers, at least a couple of touchdowns, a Foles passer rating of more than 90, and more than 4 yards a carry for Jay Ajayi. Minimal penalties that put Foles behind the chains. Where do the Eagles’ special teams stand, in terms of matching up with Atlanta? Kenjon Barner's 8.9-yard average on punt returns is better than the 7.4 average of Atlanta's Andre Roberts, but Roberts gets 22.6 yards per kickoff return, better than Barner's 19.4. Donnie Jones' 45.3-yard punting average is better than Matt Bosher's 44.9, and Jones landed 21 punts inside the 20 this season, to Bosher's 19. The Eagles gave up 6.8 yards per punt return, to Atlanta's 8.1. The Eagles allowed only 21.6 average yards on kickoff returns, to Atlanta's 26.2. But the Falcons' kicker is an old Eagles nemesis, Matt Bryant, who in 2006 with Tampa beat them with a 62-yard, final-play field goal. Bryant, a star of the Falcons' wild-card-round win, hit 34 of 39 field goals this season (87.2 percent) and was 8 for 9 from 50-yards-plus. Jake Elliott hit 26 of 31 (83.9 percent) after taking over in Week 2 following Caleb Sturgis' hip flexor injury. He was 5 for 6 from 50-plus, including a game-winning 61-yarder against the Giants. Elliott missed three extra points this season. Bryant missed none. If the Eagles win, what do the special teams need to show us to give hope for the NFC Championship Game? A nice return or two, preferably for a touchdown. No huge breakdowns, no penalties. A blocked kick or punt would be nice. Overall, show you can consistently help put Foles in decent field position.